The absolute best boxing mitt drills used to train fighters. Want to know where all the great boxing champions first learned their boxing techniques? HINT: It probably wasn’t on the heavy bag, in shadowboxing, or even in the ring. It was most likely on the mitts! That’s where your trainer pulls you aside, shows you a few things, and then lets you try it out. He’ll keep correcting you and if you get it right, he cuts you loose in the ring to show it off. And then next week, he gives you a new trick and repeats the process all over again. It’s possible to say that every refined boxing skill was first developed on the mitts! In case you’ve always wondered, here are the best and most common mittwork drills used in boxing gyms today. You’ll find all the typical routines for developing a fighter’s punching technique, power & speed, defensive maneuvers, footwork, and counter-punching reflexes against all styles of opponents. Every beginner boxer needs to know all these drills ASAP! 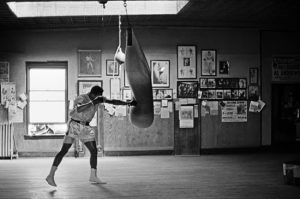 2 years ago, I wrote an article on boxing focus mitt training, where I explained some principles and tips on proper focus mitt training for fighters as well as mitt-holders. 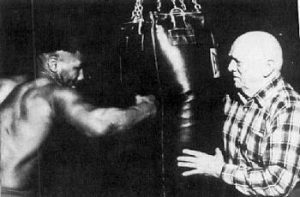 In this article, I share the actual drills used in virtually all competent boxing gyms around the world today. It’s important that you know these because they are all tried, proven, and effective. Better yet, it’s important to know what it is that make a focus mitt drill effective. for realistic fighting movements using good technique. Although it’s tempting to invent your own drills, and I always advocate exploring possibilities and finding what works for you, it’s important to have a few guidelines. The first thing is to train good habits. The second is to improve reflexes, not memory. This should be the most basic drill. The mittholder and fighter move around the ring getting loose. Using their legs and start popping off jabs. This drill is ONLY for practicing the jabs. It’s great for beginners to get used to throwing boxing’s most important punch and strengthening their weaker arm (since the stronger arm should be in back). You don’t say anything, you simply flash him the mitt and he’s supposed to hit it as soon as possible. You can do the same thing but this time you only flash the mitt for a quick moment and then take it away. This way, he has to stay close and ready at all times. You can flash one mitt and then as soon as he hits it, you flash him the other mitt. There can also be moments where you throw a punch at him without calling it out. Make sure he’s being ready to defend at all times. Then throw a punch at him and immediately afterwards flash him a counter-jab opportunity. You call out *JAB! *, then throw a counter at him after he punches, then quickly flash him a counter-jab opportunity. You call out a jab to the head or body, then give him another jab opportunity, then throw a counter at him at the end to test his defense. You can call out a jab, then after he hits it, you step around him and flash him another opportunity. This is where beginners start to have fun and get a little careless. The most important thing is to stay ready and relaxed at all times. Practice good punching technique and try not to load up on every shot. Power comes from relaxed effortless release, not because you shove all your might through every punch. Also important to snap your punches instead of pushing them through. When calling out combinations, I call out numbers since it’s faster than yelling, “JAB, RIGHT CROSS, LEFT HOOK, RIGHT CROSS!” Please refer to my combination punching list to understand my numbering system and also to see more combinations. A tip for these…I just say, *GO! * and the fighters know to throw 5-6 punches and end with a cross to the head. If I hold the mitts up high, they know to punch up top, if I hold the mitts down, they know it’s uppercuts to the body. This is to train their auto-defense and countering skills. This is where the REAL BOXING skills are learned if you ask me. You have to be able to defend and counter at the same time. The most important thing is to stay balanced and keep the flow going. You’ll find that some fighters are so offensive-oriented that their defense maneuvers feels tense or unresponsive, and then other fighters are so defensive-oriented that they focus so much on not getting hit that their punches either lack power or continuous flow. Just let them know that it’s ok to miss some punches and it’s ok if you get hit…the most important thing is to keep going and to pay attention to the next thing coming at you. This is a great opportunity to learn where to look during a fight since many beginners find it hard to see everything coming at them. The combinations I gave below are only typical examples. Have fun with these and start coming up with your own defensive drills. Feel free to use other punches to keep training fresh. Move around each other and the trainer will throw single jabs to the head or body. Move around each other and the trainer can throw a surprise wide looping shot at any moment. Trainer can test jabs and right hands to the head or body. Trainer can throw any combinations now. Trainer can quickly step in at any moment and throw a quick light flurry at the fighter. Trainer can move around, be close or far, and then open with any random punches he wants. Call out *JAB! * and then immediately throw a jab back at the fighter for him to block. Sometimes throw your jab at the same time he’s jabbing. Call out a 1-1-2 and then throw a counter jab (to the head or body) once he’s done. Call out a 1-2-3 and throw a counter 1-2-1-2 when he’s done. Make him block a 1-2-3-2, and then counter with a 2-3-2. Make him block a 1-2-3, and then counter with a 3-2-1-2. Make him block a 5b-6b, and then counter with a 5b-6b-3-2. Trainer throws double jabs. Fighter can block the first and then slip the second, or slip both. Trainer throws triple jabs, Fighter slips as many possible. Trainer throws 1-1-2, fighter can block the first punch, slip the last two. Trainer throws 1-2-3, fighter blocks the 1-2 and rolls under the hook. Trainer throws 1-2-3, fighter slips all three. Trainer throws double hooks, fighter rolls under both. Trainer throws many straight shots (as the fighter only blocks), and at any moment, finishes with a double hook (forcing the fighter to roll under both). Trainer calls for 1-2, counters with a jab. Trainer calls for 1-2, counters with a jab, then gives him an opportunity to land a right hand. Trainer calls for 1-2, counters with a left hook, fighter is expected to roll under and step away. Trainer calls for 1-2, counters with his own 1-2, fighter slips both and counters with 3-2. Trainer calls for 1-2-3, counters with a right hand, fighter slips and counters with 3-2. Trainer calls for 1-2-1-2 or 1-2-3-2, and then immediately throws 2 hooks (forcing the fighter to roll under both), then have the fighter counter with 3-2. Trainer can throw any combination, fighter has to do what he can to not get hit. Try to have the fighter escape the last shot by slipping or rolling under to get away. Get into the habit of making the opponent miss completely to help create an escape. Have fighter practice all defensive maneuvers while throwing combinations. Please refer to my combination punching list for more examples. Time to work on involving footwork maneuvers into your offensive and defensive movements. The most important thing is to stay relaxed, balanced, and flow into all your movements. Many fighters start jumping around and wasting energy once footwork is involved. The key thing I can say for footwork is to keep your footwork effortless and natural. It should feel like you’re walking around rather than jumping around to rush your body in position. In a real fight, anxious fidgety footwork not only wastes your energy but telegraphs your intentions to an opponent and makes them more cautious of your movements. Stay relaxed and you’ll find it’s so much easier to get close and land a hard counter. Trainer calls out *PIVOT JAB! * and the fighter throws a jab while pivoting his back foot around. This move allows him to land a jab while swinging his body out of the way. To test the fighter’s pivot, the trainer can throw a right hand right after he jabs (so he can make sure his head is out of harm’s way). Trainer calls for a 1-2-3-2-1p. The “p” means the fighter will jab on that last jab, and the trainer can against test his pivot by throwing a counter right hand to see if it hits him. Trainer can yell *PIVOT* and throw a right hand at the fighter, the fighter pivots and then throws a 2-1-2. Trainer calls for a 1-2-3p, the fighter pivots on the hook (avoiding the trainer’s right hand counter), and then finishes up with a 2-1-2. Have the fighter constantly moving forward as the trainer calls out combinations while backing away. The fighter’s job is to cut off the ring and not let the trainer run away or escape. Of course, the trainer will have to test the fighter’s defense not to let him get close for “free”. Have the fighter constantly moving backwards as you call out combinations. The trainer’s job is to keep closing the distance and trapping the fighter on the ropes. The fighter’s job is to escape, moving away, pivot away, and cutting around the trainer and creating space as often as possible. The rule is he’s not allowed to run, he has to use relaxed and skillful foot movements. Have the fighter practice combinations where he moves in-and-out to avoid combinations and then jump back in again. Have the fighter throw a jab, step out to avoid a counter and then back in with a combination. Or have the fighter throw a combination, step out to avoid a counter and the back in with a quick counter jab or 1-2. Both the trainer and fighter are close to each other, upper bodies touching or leaning on each other. Work on different combinations and see how different they become when thrown up close. Have the fighter work on pivot around to create angles and finishing the combinations by pivoting away or stepping away. Have the trainer lean and push the fighter into the ropes, practice combinations and defense from here. The fighter has to push back or pivot to create space and also pivot away and escape after the combinations. Also practice the reverse, have the fighter work to push and keep the trainer on the ropes as he throws combinations and goes back to wrestling or pushing the trainer to keep him trapped. So much finesse can be developed with inside fighting. Focus on developing finesse, rather than a tensed pushing contest. Practice your offense and defense against different styles of opponents. Get used to incorporating different combinations and maneuvers that you wouldn’t normally use in order to have more variety in your offensive and defensive movements. The most important thing is to find a way to remain true to your style. It’s not realistic to expect yourself to beat someone’s natural style by using awkward maneuvers that you don’t feel comfortable with. Have the trainer mimic typical stances and attacks from different styles of opponents. TALL FIGHTERS – get the fighter used to defending against long jabs and rights, slipping around long shots, rolling under hooks, and countering the body on the inside. Get the fighter used to maximizing every inch of his reach on his jabs. SHORT FIGHTERS – get the fighter used to pivot around and away from his opponent after combinations. FAST FIGHTERS – get the fighter used to defending against fast combinations, trick punches, and also chasing an opponent who moves a lot. INSIDE FIGHTERS – get the fighter used to an opponent that’s always in his space and pushing him around. Make the fighter stand his ground and know how to punch and move on the inside without losing balance. VOLUME FIGHTERS – get the fighter used to an opponent that’s always punching non-stop, don’t give him any room to breathe. Just keep making him work every second of the round. Anything you want – create any drill you want. If you see a fighter having problems against opponents who throw left hooks, focus on that. If you see a fighter having problems countering a specific movement, work on that. The trainer’s feet should be in a southpaw stance! Move around and call out different combinations. Some will feel more awkward than others. This is the typical slick-style rhythm-oriented pad routine made popular by the Mayweather family (they didn’t invent it). I love this style of mittwork and it’s truly effective for developing a natural fighting rhythm and reflexes into fighters. It will develop a lot of slickness and boxing coordination skills into your fighter. It’s really impressive and honestly one of the most impressive skill-sets of boxing when compared to any other fighting art. Because it’s hard to explain, I will simply share a video and also a link of where you can buy the program. If you don’t know how to do this or never tried, PLEASE GO DO IT! There’s so much you can learn from boxing and it’s one of those things you have to see in person to appreciate. See how automatic his offensive and defensive movements are? There isn’t very much that his trainer has to say, and yet the fighter can react to dozens of movements. There’s a very high level of instantaneous-decision-making skill going on here. You can look up older videos of him when he was in his prime and blazing fast. I picked this one so that it was slow enough for you to see what he’s doing. This drill is more often used by pros. It’s great for practicing your absolute power from all angles. 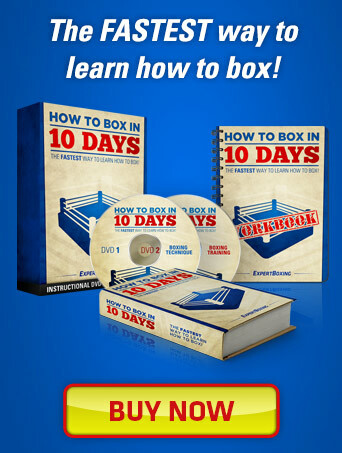 The reason why I don’t recommend it for beginners is because beginners haven’t yet learned how to throw punches efficiently yet. And so if you give them this drill, it’ll ingrain the habit of loading up on every shot which will take them further away from developing that smooth flowing relaxed combination-punching ability. Hold the big punching pad at different angles and have the fighter step and angle himself to get the maximum power possible on that shot. As you watch how the pros do it, you’ll see it’s a good drill to have him take up to 1 or 2 steps to practicing maneuvering himself into position to land the best shot on that target. It’s kind of a smooth-footwork drill, too. Do all the same mittwork drills that you’ve done before but with the trainer holding thin pool floats instead of actual focus mitts. I love the noodle drills for several reasons: One is that it’s harder to hit accurately since the target is thinner. Second is that it can be harder to defend against since they whip out quickly. Third is they are less damaging for both the puncher and trainer’s hands. As trainers and fighters spend many hours throwing and catching punches, their hands can get worn out quickly. Trainer can hold the noodles to be of any length (long vs short). This changes the speed, rhythm, and length of the trainer’s attacks. Fighter can be in gloves or wraps only. This changes the timing and accuracy required. What’s the secret to effective mittwork? The guy holding the focus mitts takes all the credit here. The more skillful he is, the more he is able to get to the right positions to help train your body to move with the right rhythm and right angles. Punching and holding mitts is kind of like a dance where you both give and take. And with a good dance-partner, you find the rhythm easily and quickly and everything feels good. A good mittholder makes it easy (feel natural) for you to practice blazing combinations and realistic defensive maneuvers. A crappy mittholder will make things awkward and lack rhythm. It’s like you’re never at the right distance to throw punches, or that he’s not absorbing your punches in a comfortable manner and at times, you feel much faster and more aware than he is. Any other benefits of a good padman? He can give you helpful feedback. He notices your tendencies and can tell you what things to watch for. Maybe he notices that you drop your hands a lot after a certain punch. Or he notices that you shift weight a little awkwardly or that you slip more than necessary. A good mittholder should have a good understanding of boxing technique and help you to refine your good technique rather than to make your bad technique permanent. What are your own favorite mitt drills? Any personal favorites or useful ones that I didn’t mention here? Share them with other fighters in the comments section below. i am confused.please help.shoul i leave bodybuilding to be a great boxer? Why not just do both? It’s not like you’re trying to be world champion in either. You’ll have tons of fun and if anything, you’re only adding more options to your life. Thank you for this and every other article you’ve written. I have alot of respect for you, what youve accomplished, and how you live your life demonstrating personal excellence by choosing to be great. God bless you, Johnny! I really appreciate the compliment, West. Best of luck to you. -what’s d best way to box an opponent that bobs and weaves a lot? Have you tried aiming for his chest? Or using more feints? johnny seriously Thanks for this stuff … but man i wanna ask that how can i find a better club ? Try different places and see how you like them. You don’t know until you try it. ahmed, are you from pakistan? thank u very much…during last week sparring I aimed my punches to his chest. Hi Johnny, I have a question, what are some advantages to mitt work over sparring if any? I know both improve coordination, reflexes, accuracy and qualities necessary against a live opponent, but why not do just sparring? Do you think a fighter could constantly improve even without doing much mitt work or no mitt work at all? Mitts allow you to learn new techniques and strategies, by breaking them down into singular elements and problem-solve specific areas. Sparring is basically a real-world scenario test. Mitts are like the lecture and practice homework. Sparring is like the quizzes and tests. Can you improve without ever doing mittwork? Sure, you could probably do that with sparring, slowing it down to work on different elements. But then how will you get to practice executing these movements in real-time? No opponent is going to let you practice your combinations on him. Better to have a person holding mitts to work your offense and defense simultaneously WITHOUT you having to worry about getting countered. hey Johnny, I’ve watched a few videos of Coach Rick mitt work on youtube and I’ve noticed that his fighters don’t punch with full extension of their arms and it looks more like he is touching their hands with the mitts. Why do you think he does it that way? That style of mittwork training develops automatic reflexes and fine coordination skills. It’s the same as how Floyd Mayweather does his mittwork. It’s very effective at speeding up your offensive AND defensive reaction time. With that said, Coach Rick is legit. I love his work. It’s a good 50 Punch workout for with footwork and defense for the trainer and the boxer! !